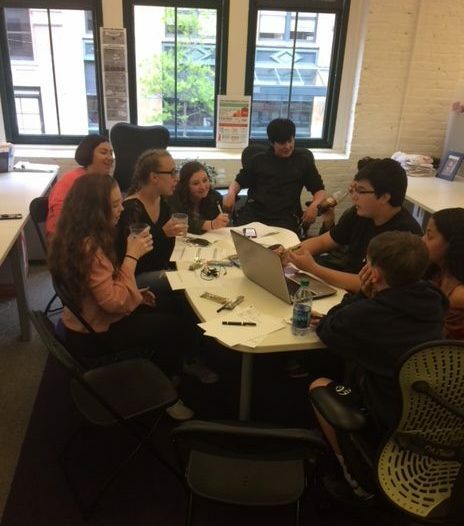 Today’s guest blog is written by teacher advocate Erik Eve, an 8th grade Social Studies Teacher in Lindenhurst, NY. He teaches honors classes using PBL, blended learning, and Google Classroom. Find him on twitter @mrevelindy. 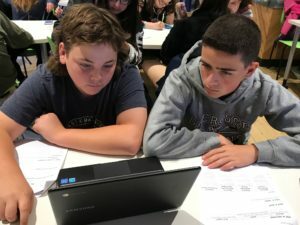 In today’s classrooms it seems that students are always on devices and their social interaction is very limited, so I wanted to make my classroom a place where the computers are a tool and communication is at the forefront of their learning. My class is also a Project Based Learning, student-centered learning environment where students sit at stations of two or four and some of them on bouncy ball chairs. One activity I like to do in the beginning of the year is assign each student to research and share a “Hi-STORY”. The student is asked to memorize any “story” from American history. They can be funny, serious, informative or just a story that they like. The students are empowered to self-direct their own learning to choose their topic and then they present the story in front of the class on their scheduled day to share out. This activity helps them stand up in front of a group, gain confidence and learn a story from history. By the end of this activity, they will have heard sixty stories from all over the world and time periods. In the beginning of the year I also like to give students group projects so they have to collaborate to work with partners, triples and quads to finish different assignments. Communication is the key to success. By setting up these workgroups, my students are required to speak to each other and communicate and collaborate. Individuals are put into situations where they must plan out what they are doing, and build interpersonal skills such as sending emails and texting to get their ideas across. As the year goes on, we build onto more collaborative processes. One project I like to give is a court case. For the court case I assign roles to each student. Some of them are lawyers, witnesses etc. I also have a judge, ADA and assistant prosecuting attorney. Students have four days to research and then we put on a trial in class. Good communication is the key to success in this activity. If the students cannot convey their ideas or points, then the case could be won or lost. The students are so busy learning about their roles and the procedures of the court that learning American History isn’t even on their mind. At the end of the trial, the history is embedded in their memory through this engaging activity. The other project is to have my students create their own news cast. During the news broadcast, students are divided up into teams of five, six or seven. Their task is to put on a 40-minute news broadcast about a particular time during the 1920s or 1930s. They all have roles such as the anchor person, reporters, guest stars etc. They have three weeks to put this together and a week of the news. Communication is absolutely essential. A lot of educators ask me, “don’t you have any problems with the kids speaking and communicating with each other because some kids just don’t get along?” and the famous $1,000,000 question, “when the kids work in groups, isn’t there often one or two kids that does most of the work while the rest just fool around?”. Well to answer those questions. Yes, kids don’t always get along, but I make sure that I solve any drama immediately something arises and work through the drama with them. From my experience as a teacher I have concluded that most times kids do want to work together and want to do well. However, every now and then a kid just has a bad day or may even struggle with a bad reputation. I find that if we all speak together, it helps. The kids have to use gentle comments and suggestions to help each other along. I also use “Work logs” on most of the assignments. A work log is where you log what work you have done in a particular day on an assignment. The kid who has really struggled to work on the assignment will have nothing there. If I see a kid that hasn’t logged little or anything, I grade the project accordingly. The kids figure out really quickly that they have to put in the effort. I ensure that the projects are embedded throughout instruction and directly tie their tests to the projects so if they don’t do anything they won’t do well on the test either. I believe that communication is the key to being successful in most things in the world and the classroom is not an exception. The most successful people that I have met are great communicators. I hope that these suggestions give you some insight and advice in how you as a teacher can better facilitate learning experiences to help improve your student’s communication and collaboration skills. If you have other activities or lesson plans you like to do that supports student collaboration, please share in comments.